Aspen Media will be on Stand F30 at BVE this year and they will be showing Junger Audio's Smart Audio, the new smart routing control for DirectOut's MADI router,the latest mixing desk from Stage Tec, designed to fit in the confined space of an OB truck, a smart ethernet switch for Audio over IP applications and the TAC Monitor Controller. Anthony Wilkins, Jünger Audio's International Sales Manager, will be on the Aspen Media stand to demonstrate their Smart Audio process. This is adaptive audio processing that is designed to control and manage the audio from several different sources in live and fast moving TV and radio production environments at the press of a button. DirectOut's Sales Director, Jan Ehrlich, will also be joining the Aspen Media team to show the new simple routing control capability of the M.1k2 MADI router. 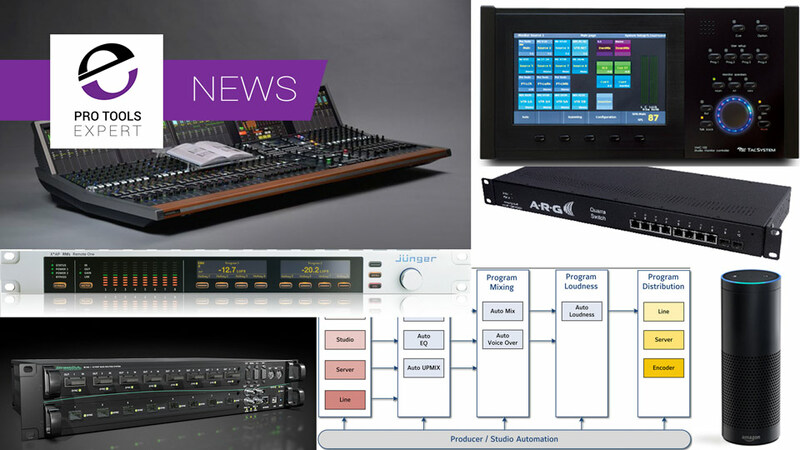 Audio routers are becoming key components in broadcast systems and by their very nature need to be capable of being individually adapted to the specific requirements of each system and user. To make life easy, DirectOut has added a simple and customisable programming module to the M.1k2 that lets users build their own control panels using a simple scripting language. Consequently, commonly used set-up changes or routing presets can be activated by a single click of the user-created button in the newly introduced control panel. Aspen Media will have a UK first when they present a 32 fader Crescendo Platinum mixer at BVE. Crescendo Platinum is designed to be extremely flexible providing a minimum of 8 to a maximum of 56 channel strips. The modular design makes it a great choice for OB trucks especially as its power consumption is low, no fans are needed and it’s only 60cm deep. It utilises the Stage Tec NEXUS routing system and gives extended Mosart control with support for different cross-fade times. Using IP based Ethernet networks allows significant numbers of audio channels or increasing resolution video signals to be transported to many different and changing destinations. To do this, a secure and stable network is needed with all devices tightly and accurately synchronised. Precision Time Protocol or PTP is used to ensure the necessary sync accuracy; but to ensure the PTP timing data has the required priority, it is recommended to employ PTP Smart technology. ARG has introduced the Quarra range of PTP Smart switches that guarantees PTPdata receives the highest priority and maintains its accuracy, regardless of network load and structure; fulfilling this crucial requirement for resilient Audio-over-IP networks in broadcast, production and live applications. VMC-102 is a surround monitoring system for Dolby Atmos or MPEG-H immersive film, post and broadcast sound mixing in studios using Pro Tools, Pyramix or Avid systems. It's a desktop unit with touchscreen control and Avid S6 users may be pleased to know that there's a version that slots directly into their control surface. VMC-102 provides 128 inputs and a 32 channel monitor bus expanding beyond the single 5.1 input monitoring sections of most consoles or controllers. It facilitates multi-stem monitoring using two or more multi-channel speaker systems managed by the integration with the DirectOut ANDIAMO 2 bidirectional MADI interfaces. Amazon Echo is a hands-free speaker you control with your voice. Ask Alexa to play music, provide information, news, sports scores, weather and loads more; hours of fun. you could even try "Alexa make me the winner of the Amazon Echo on stand F30."